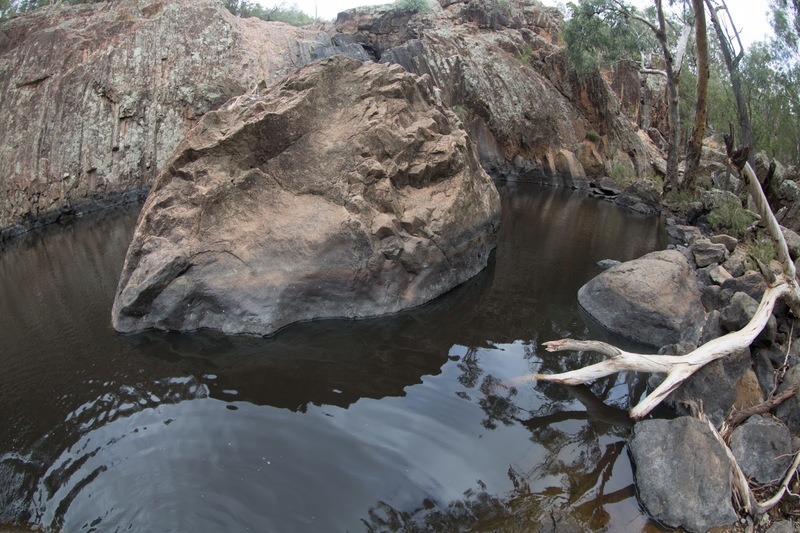 The Lachlan River is a long tributary of the Murrumbidgee system. The erratic flows in the river and significant impoundments of the water means that it only reaches its destination when both rivers are in flood. 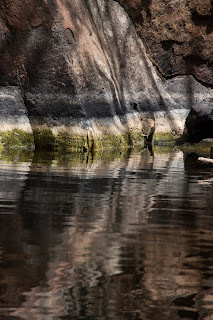 So too the falls at the top of this system: they are often dry, leaving silent deep cool plunge pools in their wake. This 70m (210') fall carves an impressive cave system before tumbling down to the Abercrombie River. 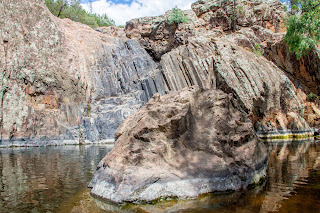 You can still find gold flecks in the creek and one of the old prospectors walking the hills will tell that the first miners into the area found a waterfall faced with the precious metal. 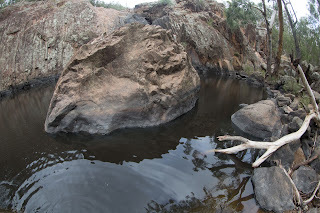 Grove Creek takes it's name from the occasional small sandy groves along its path, populated by casuarina trees. The casuarina tree has needle like leaves and indifferent wood. But it has two special powers. Firstly, it stops bush fires. The touch of fire will also kill the tree, but another will grow quickly. Secondly, it can sing. If you sit in one of these groves, and hear a breeze in the casuarinas, you may not be able to leave. East Australia is in the grip of a drought. This particular area is usually dry (and these falls silent). These shots are after good rain. Just above the falls is a disorienting place, where you can quickly loose sense of balance. As in Esher's 1951 'House of Stairs', the scene plays tricks on the eye. 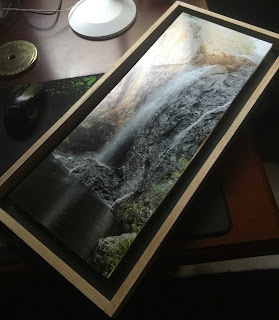 Does the stream to the middle waterfall run uphill to make it's plunge? 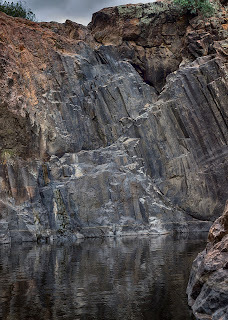 In addition to the hazard of loosing perspective, the surface of the rocks near the falls are smooth and slippery. There is a mystery here (apart from the nuggets of gold that might be at the bottom of the pool). From a distance, the path of the fall and the rock fractures combine to give a lattice effect - that plays tricks on the eye - if you look at the moving sheet of water, the fall looks a little like the scales on a moving snake. 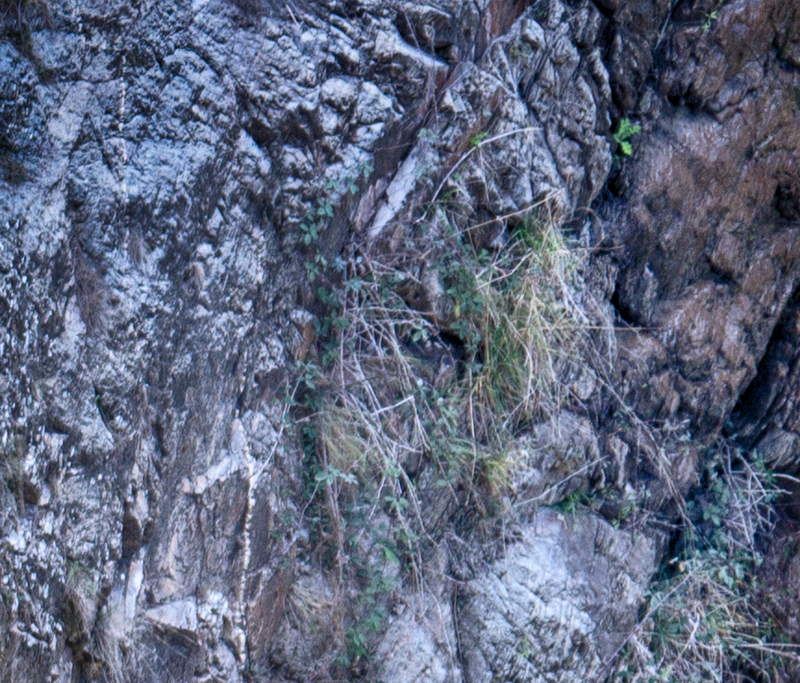 It took a little while, but eventually i found a weathered carving of a snake on the waterfall wall. Can you see it? The eye gives it away - it cannot be a natural feature. 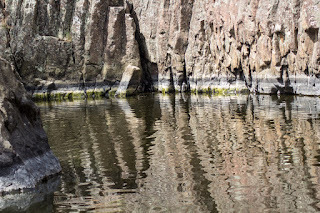 I took shots from a number of vantages - i think (but cant be sure) that the eye is carved and the curve of the body has been deliberately chipped (it deviates from the rock structure). 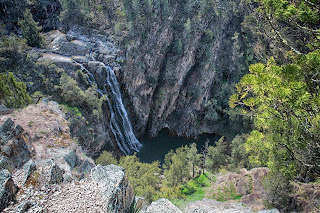 There is a dream-time story that connects this place with Jenolan and Wombeyan (all places of extensive caves). The first people traveled across this land, but the rivers and streams were of primary importance to them. The first people were spiritual but practical. The law of the people determined the names of things. The law set how stories could record names. It set out how stories could retell the names in ceremonies. It required newborn children to take the name of the closest named place to birth. A person’s name tied the person to the land. In the far past, animals claimed the shapes of men and women. They walked the world as giants. Two giants formed the land including Abercrombie, Jenolan and Wombeyan. The serpent fish Gurangatch lived in the deep rivers. From the name you can tell that Gurangatch is big and powerful in water, capable of moving fast. The tiger cat Mirragan lived in the forests camping by the sides of the rivers. From the name, you can tell that Mirragan slides through the shadows of the night forest, deadly silent. 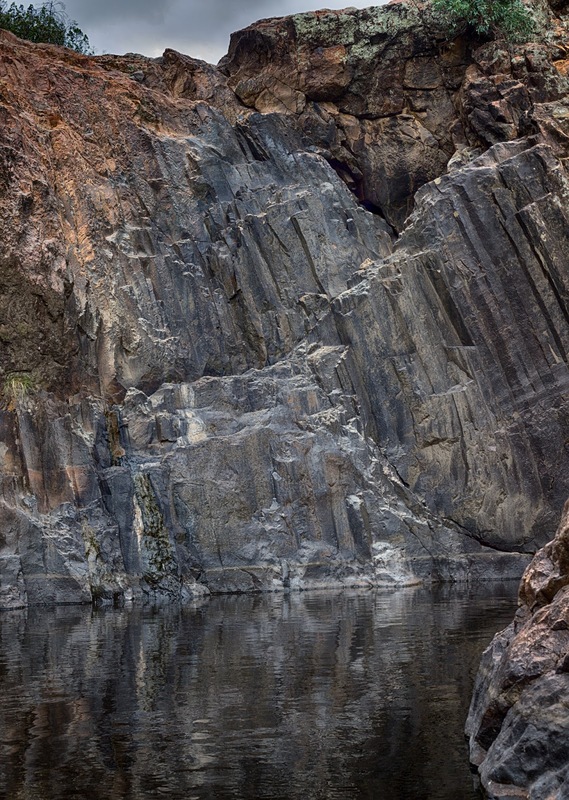 The battle between these two giants scarred the land, leaving waterfalls and deep pools in their wake. This dream time story is a little different to the Yuin story associated with Tuross Falls. 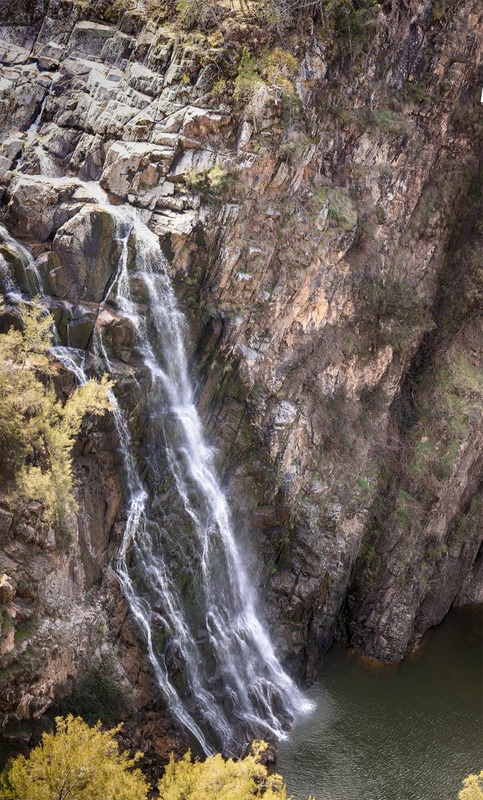 In midsummer some Australian waterfalls take a break and dream in the hot sun. On the rocks surrounding the path of the multiple falls at this point, it is baking hot. 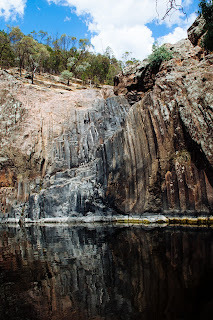 But in the bottomless pool beneath Koorawatha Falls, the water is deliciously cool although it becomes colder as you swim deeper. 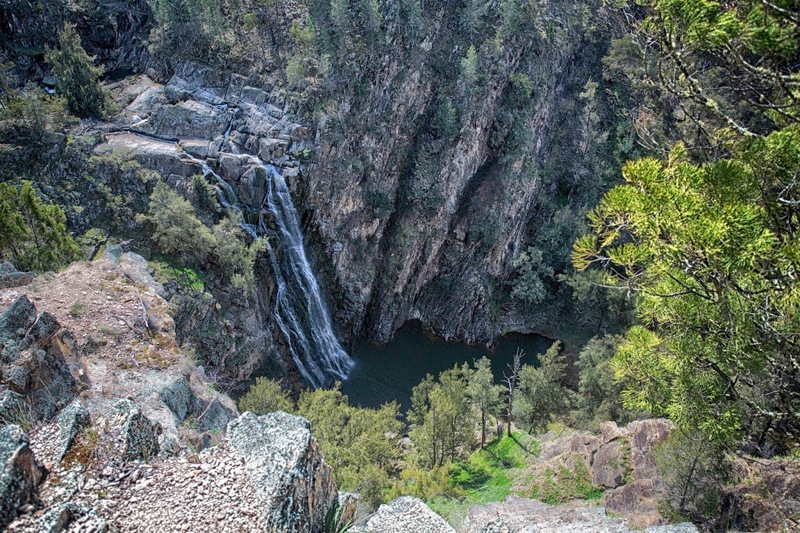 Koorawatha Falls is at a surprising confluence of waterfalls and a deep plunge pool on the Bang Bang Creek near the cherry orchard district of Young. From here on westerly, bush people call rapids in one of the large slow moving rivers a fall. 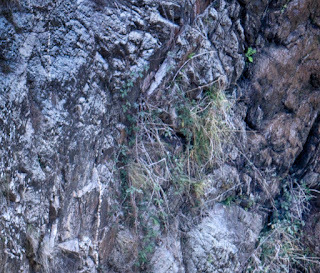 The fall is often dry, allowing the sure footed visitor to explore the cave near the top of the fall. The right hand side of the fall has a unique 'racing stripe' caused by variations in the pool level, and algal growth. On another visit the 'racing stripe' may disappear or change position. The ripple was caused by the toe of young boy who, with his sisters, had walked from their farm to the falls for an adventure - the three of them took me to the best places to take shots of the fall, and then told me all sorts of unbelievable stories about the place while i traded a couple of bottles of water for a muselli bar. I think that the older sister told me that a bushranger once lived in the cave half way up the falls. In the bush, unbelievable stories are always carefully chewed over, because they often turn out to be believable when it is too late. I trust the stories of old bushmen who sometimes share their experiences of the uncommon with me. In the city it is easy to discount the stories of dark unknown shapes as tricks of the light, a feeble mind or delusion. It is a different matter when you must ride through the dark forests, far from other humans. The drop-away here under the water is very sudden, and perhaps dangerous for those not confident in water. 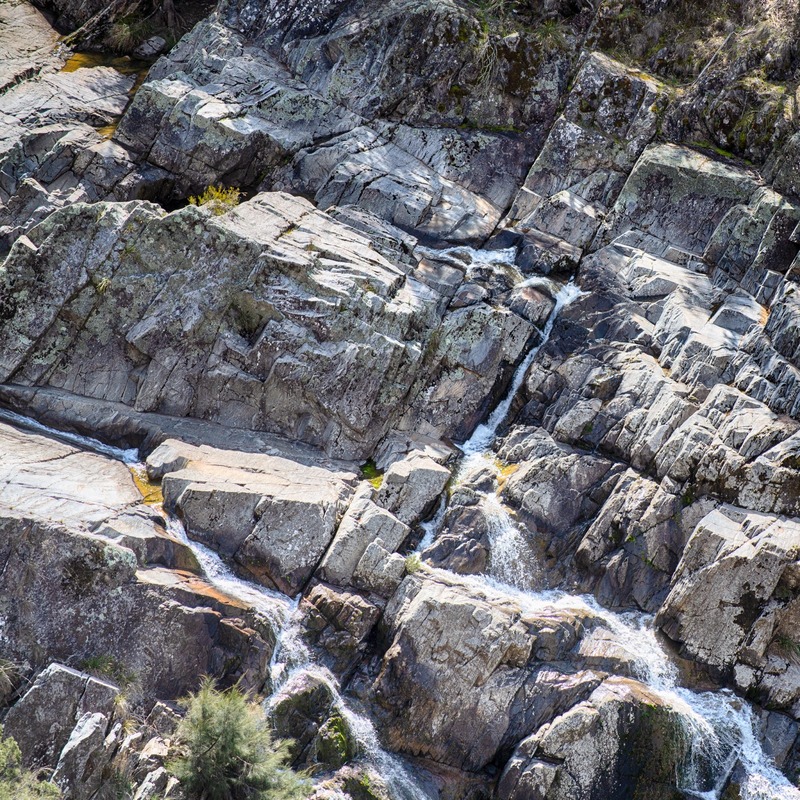 The track to these falls is strictly 4WD with deep ruts and sloping road surfaces. After rain (the best time to see this western waterfall in action) the road is impassable. Park by the side of the creek near a basic weather shelter that lies in ruin, just before the weir. The track to the falls is fairly self evident, but will require a scramble in places. 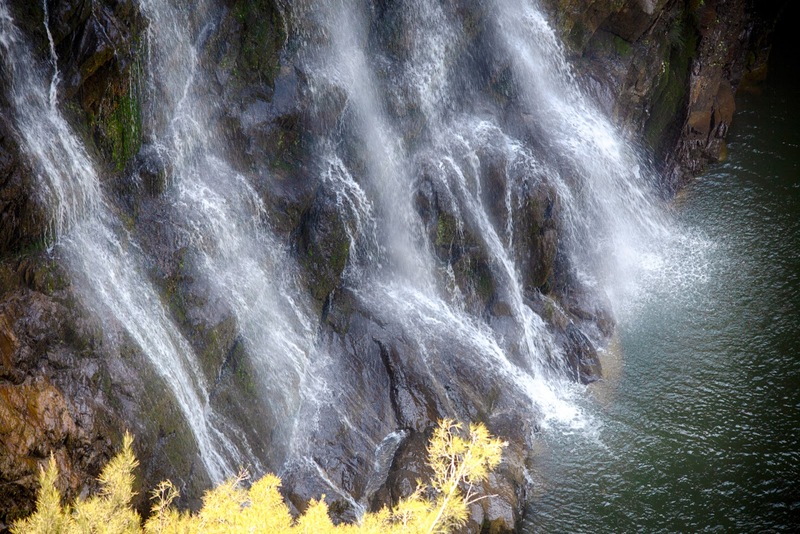 Enjoy the 20 minute walk along the dam to the confluence of the waterfalls and the plunge pool. These places are poorly signposted. For Grove Creek, it may be worth getting directions to the fall and vantage points from the Abercrombie Cave House (and visiting the caves while you are there).